spoilertv.com posted today that Supernatural was only having 20 episodes this year. One of the moderators said that ‘maybe’ there will be more episodes ordered. I just don’t get why only 20; the idea that the Js would want to only do 20 episodes does not surprise me. Do they do more conventions than any other CW actors? ALSO all the CW dc ‘verse’ shows are set for 22 episodes. Paula, do you have any info on this? I saw that. The problem is that they didn’t give any link aside from saying it’s from the WB site and I didn’t see anything on the WB site about episode count for season 14. So, really, it’s just Spoiler TV making that claim right now. It’s not even on Twitter. Is it possible? Sure. The CW is going through some major changes right now. It’s added a new night and is expanding the number of shows it’s got. Problem is, we don’t know how much more of a budget it’s getting for all that and there’s a lot of network experimentation with show numbers to match reduced budgets. The most ridiculous news is giving Riverdale a 23-episode season (despite a ton of promotion, that show’s ratings have been pretty disappointing for the CW), though this may well mean they’ve thrown in the towel on trying to get the show past season four and just want to get to a syndication number as soon as they can. It’s possible that Padalecki and Ackles are getting tired (Lord knows they’ve shown amazing stamina to this point, already). Creation said a couple of months ago that it was cutting back on the number of cities where it would be doing Supernatural cons in next year. Or it could be they’re going to try another Scooby-Doo episode. Released production dates so far, though (July 9), line up with the usual number of episodes. As usual with spoilers this early (such as Mark Pellegrino saying Lucifer isn’t really dead), take with a chunk of rock salt. Not very much that’s released before they start filming/go to SDCC ever pans out. I don’t think we even know yet if Jensen Ackles will be directing this season. Is there something wrong with my browser, or does the recap really stop after one paragraph? Hope the rest will be posted soon. Sorry! It got published by accident the other day (I was trying to start the season finale recap) and I thought I’d managed to unpublish it. It made for a good double take from me! 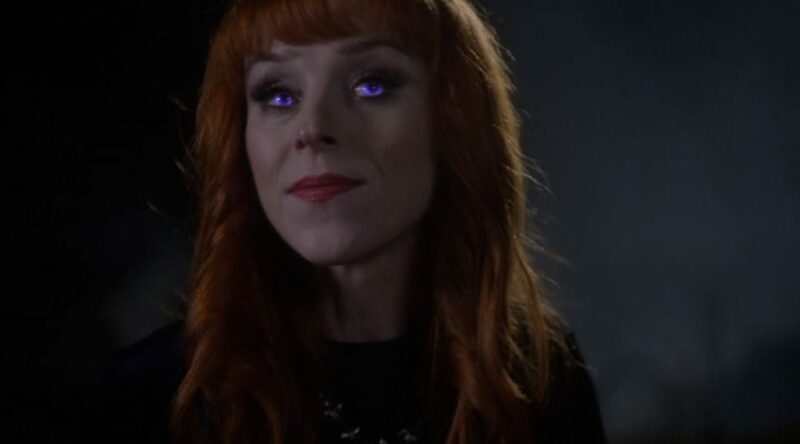 Rowena roasts the woman, then credits. Perfect episode, the end. LOL! Sorry! I’ll try to finish it tonight. I gotta catch up with these, anyway, do the season finale review, and then catch up with those. This is the one that I did not get due to my satellite dish being struck by a tree. I am looking forward to your analysis.